2014 TVS Wego 110 Specifications and Features - In a world where it is increasingly hard to spend time with the one you love, we present a scooter made to bring you closer together. Built just for two, the Wego 110 has a host of features that makes every ride comfortable. Even in the midst of the busting traffic and crowded streets. So take to the road on the brand new Wego110 and enjoy Your We Time. 2014 TVS Wego equipped with engines 110 cc, 1-cylinder, OHC, air-cooled, and transmission Vmatic. This engine can generate power 8 hp at 7500 rpm and torque of 8 Nm at 5500 rpm. 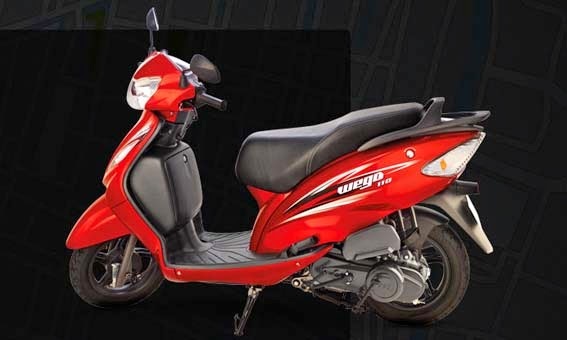 TVS uses aluminum material low friction air to the engine Wego. In addition, Body Balance Technology belongs to Wego makes you more easily to control the steering, control and better maneuverability. International Design - Modern Styling : Wego is the luxury scooter that adapts to your needs, equipped with the highest quality features. It's more than a scooter. All Black Alloy Wheels: The alloy wheels are Durable, Stylish & Lightweight. Golden Eye Indicators: Golden Eye Indicators give the Wego a distinctive new 'face' as well as delivering a more intense spread of light to enhance safety.